"Why have my SharePoint Alerts stopped working?" is one of the most common questions asked in SharePoint forums and News Groups - and one of the most difficult to get a straight answer to. Which is why Pentalogic Technology are sponsoring a new Infosite: SharePointAlerts.info - everything you ever wanted to know about SharePoint Alerts - all in one place - including a full answer to the vexed question "Why aren't my alerts working?!?" Why have my SharePoint Alerts stopped working? "SharePoint's built in Alerts are one of the best used features of the system - but also one of the most problematic. There are just so many different ways they can go wrong!" says Pentalogic MD Ryan Wheeler "And when they do go wrong the internet advice available on how to put them right is very fragmented and often confusing. All manner of suggestions come up - many of them not appropriate to the particular problem the user is having." "Here at Pentalogic we like to think we have a pretty good knowledge of SharePoint - particularly Alerts as this is one of the areas we specialize in. So, we have had it in mind for a while now to put together a comprehensive guide to trouble shooting Alerts. Something with a logical flow - which hopefully has all the information you need to solve the problem: set out clearly in one place." 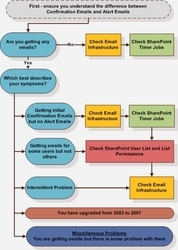 "Producing the SharePoint Alert trouble shooting guide has turned out to be quite a mammoth task, but now we think we are there and the guide is the centerpiece of the new http://www.sharepointalert.info website." "Over the years we also have amassed quite a store of hints and tips on how to make best use of SharePoint's built in Alerts, as well as a good knowledge of the alert enhancement products on the market: so this is all on the site as well." "We hope the site is going to become a useful resource for the SharePoint community. We want to make it very clear (especially for our own customers) that this is not a "help" site for our own SharePoint Reminder Software. The information in the site is very much focused on SharePoint's built in "Alert Me" feature and we have developed the site as a resource for SharePoint users in general." Ryan explained, "But if more people should happen to get to know a bit more about Pentalogic and what we do through looking at SharePointAlert.info, then we certainly won't be complaining!" third party alert enhanement and administration tool listing - with space for your reviews and comments. "We will be adding to the site regularly ourselves but we also want the site to be interactive: we welcome guest contributions, comments and feedback. So if you have a ninja move you'd like to Share, or a new Alert product you want to rave about visit SharePointAlert.info today and have your say!"